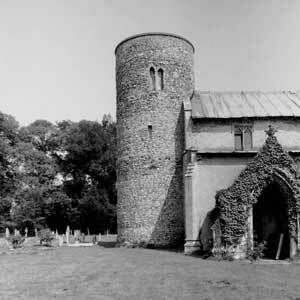 A round tower church in the heart of Breckland has been awarded £100,000 by the National Lottery Heritage Fund. St Peter’s Church, Merton, near Watton, will also repair its nave roof with zinc – having twice been the victim of lead thieves in the past eight years. The latest grant will enable the church to be used as a local meeting place and for seminars, workshops and concerts to be held. A number of initiatives to promote the church’s heritage and history will also be undertaken. The grant has been welcomed by the Round Tower Churches Society, which offered financial help for urgent repairs immediately after an estimated £2,000 of lead was stolen in August 2015. The chairman, Stuart Bowell, wrote to the Eastern Daily Press after that 2015 theft, explaining that the total repair cost was likely to be around £25,000. St Peter’s stands on raised ground overlooking the lake and Merton Hall. It has been closely associated with the de Grey family and their ancestors, who have been lord of the manor from the Norman Conquest. The society gave £500 to the church in 2015 and members were given a guided tour of St Peter’s two years ago. Since the society’s formation in 1973, it has now given almost £200,000 in grants to round tower churches. The overwhelming majority of more than 180 round churches include 124 in Norfolk, 38 in Suffolk and half a dozen in Cambridgeshire. This entry was posted in News on April 13, 2019 by Patrick Prekopp.